I’ve paused updating this site to focus instead on my primary domain over at https://www.reids4fun.com. You can still read what crazy program I’ve published this month. Even better, read a few other articles! Another year, another month, and now another program to celebrate 2013. January’s program of the month is an old one: Hit Man. 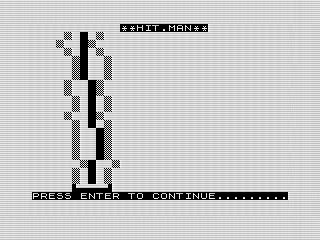 From 1983, Hit Man was my attempt at creating a wall dodging program and it is a tough one to play. Looking back, I probably should have made the walls a bit further apart. The controls aren’t the most sensitive either, making the game more luck than skill. That said, it is fast and has that old game nostalgia that will remind you of those impossible to play games of a by-gone era. Short and sweet, I have fond memories of the game. Interestingly, the toughness isn’t part of my memory. I guess time really does dull the pain. Enjoy and see you again next month. If you want to run this program on your Android phone or tablet you can download a compressed copy of the program to your device. You'll need to save the .p version of the program to your device to allow Zed Ex (Beta) to run it.